Nile crocodile is one of the world’s largest and most powerful crocodile. Their strength is epitome of power. In fact, Egyptians considered Nile crocodile as god of fertility, power, and protection. This giant, strong, magnificent creature intrigues interest of all. Find out all about the species including the most interesting ones also. Head : The head is similar to that of all other reptiles, located at the beginning of the huge body. Its eyes, nostrils, and ears are on the upper side of the head. Throat : It has very strong and powerful jaws that help them grab the prey very firmly. At the backside of the throat it has a special valve. This valve prevents water from entering inside when it opens its mouth to catch prey under water. Body : It has a streamlined body with spikes on it. Its tail is long and very strong with spikes as same as on the rest of the body’s upper part. Feet : Nile crocodile have four feet. The hind feet are webbed and long. Color : An adult Nile crocodile is greyish olive in color. Underneath part is yellowish in color. 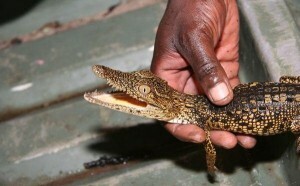 Juvenile Nile crocodile is dark olive brown or green colored. They have black colored cross band on its body and tail when at young age. As the species grows in age the band becomes fainter, eventually diminishing. Size : The male Nile crocodiles are larger than the female ones. Some very older ones are about 18ft in length. The males vary between 11.5ft to 16ft. in length. The female Nile crocodiles range between 8ft. between 13ft. in length. Weight : An average, healthy, and grown up Nile crocodile weighs about 225kg. Know some of the interesting behavioral characteristics of Nile crocodiles from below. They are very much social in nature. The male Nile crocodiles are also very protective about the off-springs as much as the female ones. They send messages via touch, odor, body language, postures, etc. They interact through sounds. They produce more than six different kinds of vocal sounds. They Nile crocodiles are very territorial beings. They maintain their territories strictly with extra care during their breeding season. Nile crocodiles are widely found around Lake Chad, Senegal River, Sudan, Wadai, Okavango Delta, and Cunene regions. They have been traced in the southern and western parts of Madagascar. The species have also been spotted sometimes in Comoros and Zanzibar. They actually cover the entire sub-Saharan Africa. 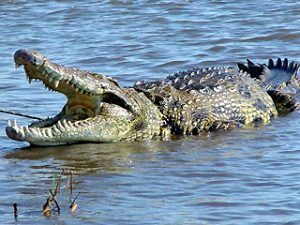 Nile crocodiles inhabit mostly in coastal lagoons, rivers, and estuaries that flank forest belts at the equator. Their preferred habitats are lakes, rivers, dams, and marshes. In some regions they have been observed to inhabit in the sea belts also. 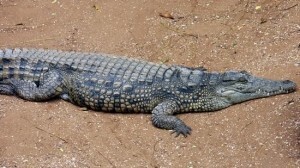 Nile crocodiles change their diet habit with their age. Younger ones diet on snakes, frogs, insects, spiders, small vertebrates, and many other smaller reptiles. The grown up ones feed on bigger animals like wart hogs, antelopes, zebras, comparatively bigger domestic animals, and even humans. Nile crocodiles mate under water. They are very protective towards their territories at the breeding time. The male ones guard around the borders of their territories. The eggs are kept in a hole in the soft soil under water, which the females dig. The females guard their eggs at a continuous stretch for 3 months, without even eating. When the hatchlings come out they are guarded for another six months and are taken to a safe zone under water only. 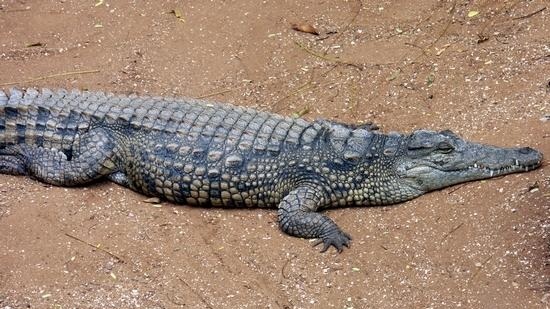 Nile crocodiles have a very long life span. An averagely healthy Nile crocodile lives for about 70years to 100years. New born Nile crocodiles grow at in size at a pace of 1 ft. every year. After hatching out of the eggs, the young ones feed on their own egg yolks, and then hunt out for insects. They stay under their parents’ supervision for quite some time. As they grow, they start eating larger animals like big domestic animals, other reptiles, and many other animals in the wild. They hunt on humans also. They live up to 70years to 100years of age. Nile crocodiles are apex predators, thus they have no predators in the wild. Only humans sometimes hunt down these crocodiles. Nile crocodile is an apex predator species. Still is sometimes being hunted if not preyed, and even stand chances of natural threats to its existence. Thus like all creatures on earth this species also has some adaptive features to sustain its existence. Their scales prevent them from oozing moisture from the body and survive during the scorching hot and dry period. Their metabolism rate is very slow. During natural calamities when not much of preys are to be found around, they can still survive without eating. The young ones are protected from being preyed by other aquatic creatures, grown up ones, by their parents. The parent Nile crocodiles are very protective and just don’t leave their kids for a long time span until they younger ones are grown up enough to prey and defend themselves. The proverb of relationship between the Egyptian plover and Nile crocodile goes that the bird hops in to open mouth of the crocodile to eat the parasites from teeth of the crocodile. Once the job is done it flies out and the Nile crocodile does not hurt or harm the bird. It is a relationship of mutual benefit. The bird gets its food and the crocodile’s teeth get cleaned. Till now the Nile crocodile species is on the safe list of IUCN, shown as Least Concerned. Because of the natural adaptive features of Nile crocodile and being an apex predator it does not stand the risk of survival threat. Find out some very interesting facts about the Nile crocodiles. 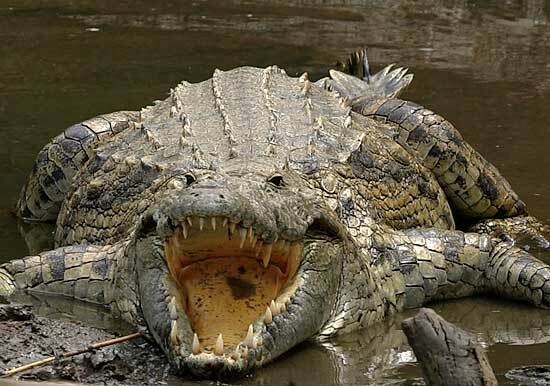 Nile crocodiles are the largest crocodile species in the world. These crocodiles are very social in nature. They are can survive without food for a long time span due to their slow metabolism rate. Nile crocodiles are capable of producing more than six different kinds of vocal sounds. This species have a very long life span of about 70 years to 100 years. The scales on the body of Nile crocodiles help them sustain the moisture within and survive in the driest of the days. In ancient days these Nile crocodiles were worshiped and were also considered as the symbol of Pharaohs in Egypt. The myth of the mutual relationship between Egyptian plover and Nile crocodile has not yet been observed to be proven true. Check out pictures of world’s largest and strongest species of crocodiles, the Nile crocodiles.